I hope you had a great weekend, Granger Bag makers! I am currently working on the Closet Case Files Clare Coat, so I’ve been catching up on Heather’s sewalong while hosting this one as well, whew! Today we are going to put bag and lining together! You will need pins, your sewing machine, iron, and shears. If you are making view B, we first need to attach the flap. 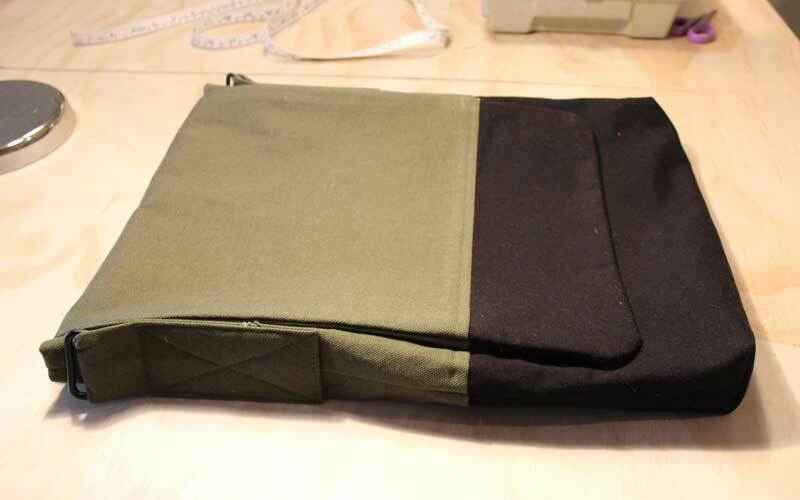 You flap should be turned in 5/8″ on the open end, as instructed in step 9 in your booklet, and your outer bag top should be folded down 1 6/8″ as indicated in step 18. Pin your flap to your outer bag 3 2/8″ down from the folded bag top. Important: The side of the flap with the snaps on it should be facing down. I made the mistake of sewing it on with the snaps up once and it was a sad moment when I turned it inside out, whoops! Sew along the stitch guides. The stitch guide indicated gives you just enough room to fold the flap out of the way when sewing in the lining, but if you are a beginner sewer, or are working with a very thick fabric, you may want to sew a smaller box, so it is easier to fold it out of the way. See the diagram below. Turn your bag inside out and check to see that your flap closes nicely. It should fit snuggly over the top of the bag, pushing the sides out a bit at the very top. The process for inserting the lining is the same for view A and B, grab your outer bag and lining and lets get started! Slide your lining into the outer bag, wrong sides facing. Push the lining corners into the outer bag corners. Turning the bag upside down helps to get the corners pushed in nice and snuggly. I like to have the zipper pocket on the back of the bag, but it can go either way. Pin the lining to the bag, 1 2/8″ down from the top edge of the bag. Start pining on either side of the bag, matching side seams. Fold the tabs and flap out of the way. Sew lining to bag, 1/8″ – 1/4″ from the lining top, it depends on the look you want for the topstitching on the lining. I like to match my top thread to the lining and my bobbin thread to my outer bag, so the stitching matches on both sides. Alternatively, you could use a contrasting thread here if you want your stitching to stand out. While stitching, fold your tabs and flap out of the way. If you struggle to fold the flap out of the way, you could sew it to the bag lining along with the outer bag. The only downside of doing this is seeing an extra line of stitching on your flap. That’s all for inserting the lining, just one more step to go! See you all on Thursday when we will make and attach the bag strap. Can you post a picture of the Top/Rear of a view B – kinda the opposite of pic 153 here? I’m having trouble envisioning what the very edge looks like finished? I added a picture of the back into the sewalong above, I hope that it helps! Great – very helpful. Thanks!